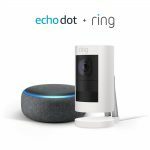 Amazon has a Ring Stick up Cam with Free Echo Dot, $149.99 free shipping. Expires Soon - Highly Rated at 4.2 out of 5 stars. Echo Dot is worth $49.